Today was a book signing with Rick Riordan. Since my family are fans, we had decided as soon as we heard about it that we were going. TG made herself a costume using cardboard boxes and some of her yarn and fabric stash. 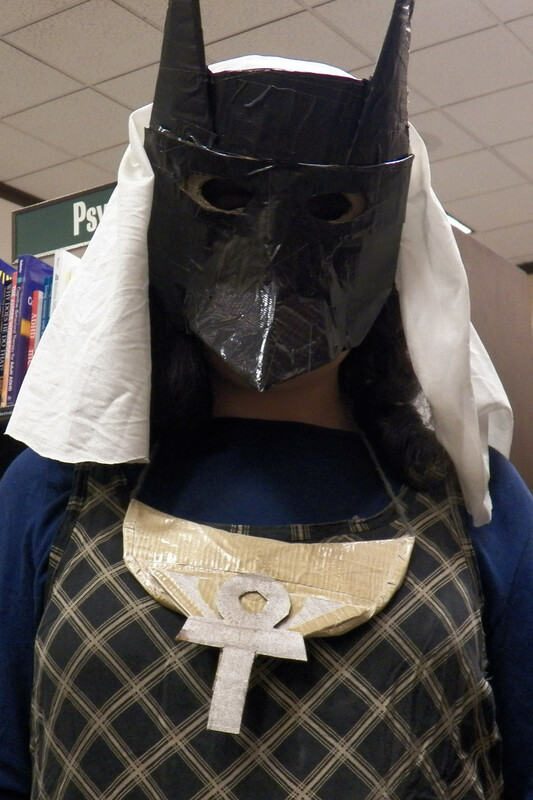 She decided she would be Anubis. Her mask and pectoral are completely her own design and execution. While she didn't win the costume contest, she did get an honorable mention. You know, major writers very rarely come to Alaska. Our local best selling authors do book signings up here of course, but we rarely get NY Times best selling authors who aren't Alaskan. 1200 people had shown up at least. Probably more. The book store, which started handing out wristbands for a place in line at 9:00am had a line around the store when we go there about 10 minutes to 9. There were craft tables, and like with the Harry Potter book release parties, a sorting area. Only instead of finding out what your house was, you got to find out your God parent and special power. Eyes closed, pulling out slips from a basket. The 4 of us all picked. William and TG both got Healing as their special gift. William had Ares chosen as his parent. He thought that was hilarious. TG picked Hestia, which triggered her doing the Xena-lookalike Hestia thing. (my family of geeks!). I got Divination and Aphrodite, Michael got Necromancy and Hephaestus. TG had fun strutting for the costume contest, and lots of people asked to take her photo. While some people came dressed as the Kanes, she was the only one who chose to be an Egyptian god. It was so crowded, but the store handled the fact it was so much busier than expected very well, and Mr. Riordan was wonderful and said he would go over the number of autographs he had originally agreed to. Since we were in the 3rd group of 100 people, we finally got out of there around 2. Mr. Riordan complimented TG's costume, and told her that he hoped she got lots of photographs of it. 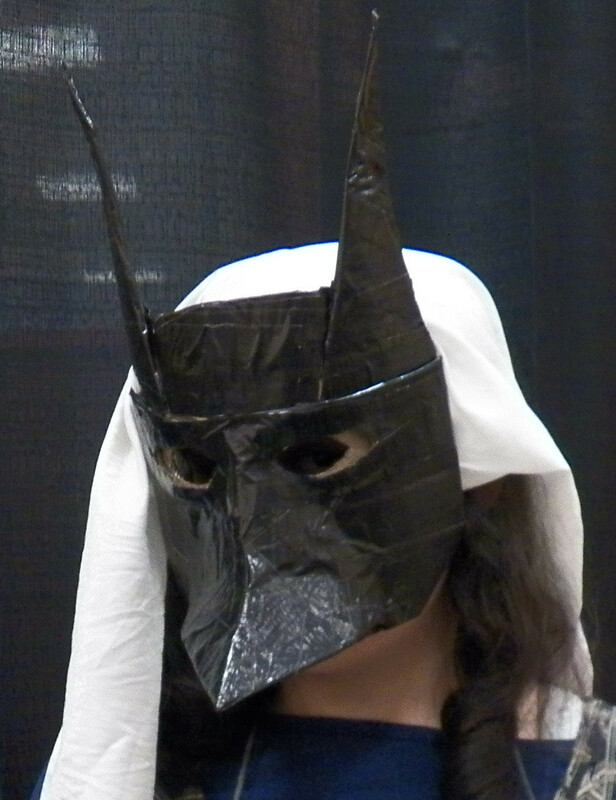 She'll probably be posting more information about how she made the mask on her Cut Out and Keep page. After that, we went to Free Comic Book Day at Bosco's Comics. John announced yesterday on the FB page that the store would allow 10 comics instead of the usual 5 to anyone who came in costume. 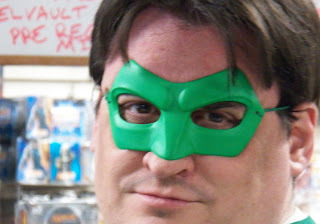 My darling husband found his Green Lantern mask, which he wore with his GL shirt and ring. TG's costume of course counted, and she had a blast picking out her free comics. After hours of standing in various lines and doing so much, we are all pretty wiped out now, but it was a lot of fun! I like Mr. Riordan's books because they are full of action from the start, the female characters are pretty strong and independent and he keeps very true to the original mythology while writing in an entertaining, contemporary way that engages modern juvenile readers. The current Olympian series is exploring the differences between Greek and Roman myth, and the Kane series is about Egyptian mythology. I'm a big fan of anything that can get youth reading the classics. It will help them to appreciate English poetry as well since so much classic poetry and plays references Greek, Roman and even at times, Egyptian mythology.